Founded in Connecticut in 1914, the American Radio Relay League is the national membership association for Amateur Radio operators. The league, a nonprofit organization, represents amateur radio interests to regulatory bodies, provides technical advice and assistance to amateur radio enthusiasts, and supports a number of educational programs. The age of wireless communication began in 1901, when Italian inventor Gugliemo Marconi transmitted the first radio-telegraph signal across the Atlantic Ocean from Poldhu, England, to St. John’s, Newfoundland. Marconi’s successful transmission created a new category of hobbyists at the turn of the 20th century: amateur radio operators. Most often men and boys, these amateurs built their own “spark-gap” radio stations to communicate with their fellow enthusiasts using Morse code. Individually constructed, the basic components of these early stations consisted of a receiver, transmitter, power supply, and antennas. At this time, most households in the US were without any means of communicating with each other. Telephones were rare, and telegrams were costly and required a trip to the telegraph office, but virtually every town had an enthusiast neighbor willing to demonstrate his hobby and deliver personal messages, called radiograms, within the community and to surrounding towns. For all radio operators, distance was a challenge. The long wave sector of the then-known radio spectrum abounded with the raspy notes of spark-gap signals, although even the signals of the most powerful of these stations was restricted to local communication within a range of only 100 miles at most. The prevailing level of technology and knowledge precluded the sending of messages over greater distances. Organizing stations to relay radiograms provided an immediate solution. Intermediate amateur stations could receive and retransmit, or relay, radiograms across the continent. 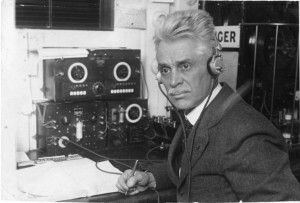 In April 1914, inventor, scientist, and amateur radio operator Hiram Percy Maxim of West Hartford encouraged the Radio Club of Hartford to organize amateur radio operators into a strong, self-reliant organization. 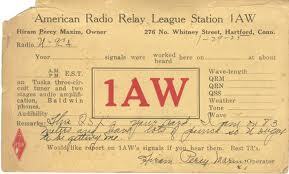 The American Radio Relay League, a union of amateur radio relay stations, was thus formed. The league recruited amateur radio operators throughout the US and imposed high standards. It was considered a distinction for an operator to be part of the league. The system grew rapidly to provide nationwide coverage. By October of that year, a list of 400 participating stations was published. Now much larger, this national traffic network is still active on a daily basis, utilizing code, voice, and digital signals, and ready to provide valuable assistance in emergencies. Concurrent with the growth of radio telegraph communications, amateurs were involved in the development of another sphere of radio: wireless telephone, the transmission of human speech and music. In 1900 speech was first transmitted via radio in a United States Weather Bureau laboratory. Over the next 10 years amateurs were the principal developers of this medium, broadcasting voice and music of improving quality and range to whoever had the ability to receive the transmissions. 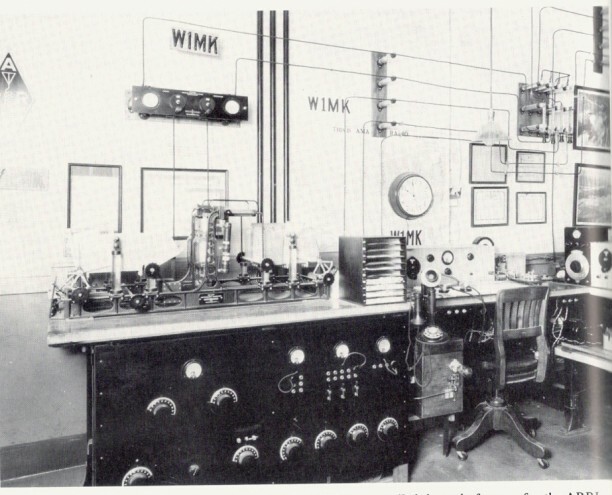 By 1920 the technology had reached a level of sophistication that permitted the first commercial broadcast station to go on the air and the transmission of voice radio by amateurs to the public was prohibited. Licensed amateurs, however, are still permitted to communicate by voice means amongst themselves. Amateur radio operators, organized by the league, not only provide daily message handling services for the public, military personnel, and service and relief organizations, such as the Red Cross, they also play an important role in civil emergencies. Radio amateur volunteers provide a communications adjunct to the professional civil services and are an integral part of the Department of Homeland Security emergency response program. When the 2011 October nor’easter brought historic snowfall and widespread damage and power outages to Connecticut, radio amateurs provided various critical services to the National Weather Service through the SKYWARN weather spotter program. Additionally, amateurs provided communications support to local, state, and federal emergency management and non-governmental organizations such as the Red Cross, Salvation Army, the Federal Emergency Management Agency, town disaster teams, and Connecticut Light & Power. Amateurs today operate their own satellites, bounce signals off the moon, and communicate with each other utilizing high speed digital processing techniques that supersede voice and code. Amateur radio operators are regulated by the Federal Communications Commission (FCC), which issues licenses with varying levels of privileges. To qualify, an individual must exhibit proficiency in electronics and knowledge of the FCC regulations. Licenses are issued to station operators and individual call letters are assigned. An amateur’s call letters become another name, not just a manner of identification but a badge of pride. The ARRL and similar organizations in other countries provide the leadership and unifying organization that has made amateur radio not just a hobby but a service to the public. Sometimes referred to as “hams,” a term derived from early wire telegraph days, amateurs sustain a proud culture. Experienced participants pass on the ethics and camaraderie of the unique hobby from generation to generation. Today, there are approximately 2.5 million licensed radio amateur operators in the world, with about 655,000 in the United States—including more than 8,000 in Connecticut. Although the amateur ranks have always included well-known figures (Senator Barry Goldwater, Walter Cronkite, and Marlon Brando, for example), radio enthusiasts share a worldwide spirit of community, one where men and women from all circumstances and walks of life meet as equals on the airwaves. There’s No Place Like Home for the Designer of Dorothy’s Ruby Slippers – Who Knew? The “Perfect Handle” Hatchet – Who Knew?